This bronze "cold cast" sculpture of a greyhound by Eric Reagan is a blend of equal parts resin and bronze powder. The surface has been polished. By definition, cold casting involves no heating up of metals. Four of 18 papier-mâché masks of animals, dragons, and monsters designed for the party-goer and the collector, these are made entirely of colored paper on cast forms made by the sculptor. The old beagle is an example of a third media form used by Reagan. It is papier-mâché covered with self-hardening clay for sculpted detail, then colored with acrylic paint and finished with several coats of lacquer. The work of two innovative creators was on view in independent tandem during the month of October at Mocha Joe's Cafe. Eric Reagan, a man of many faces, that is, masks, was one; local homey, songwriter, guitarist and visual artist Kyle Thomas was the second. Both artists have refreshing approaches to their craft. The Mocha main room was filled with over 15 new images, mostly silkscreens, by Kyle Thomas. Thomas, a Brattleboro native who is also a songwriter and guitarist known as King Tuff, is currently involved in the musical duo called "Feathers." There are a variety of drawing styles exhibited in the group of silkscreens. The conception unifying the various pieces is that they are all small drawings that have been enlarged and then rendered in silkscreen, and that means was the method of a virtual King Tuff Art Marathon. The entire show was created during the preceding month of September. Cartoon figures of varying styles, octopi and faces made up of minuscule smaller faces are subjects. 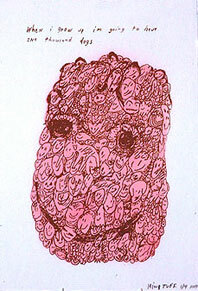 Two large, whimsical expressions are actually built of a multitude of small expressive faces crowded and piled en masse. They are "Young Godhead" and "Moonhead and His Companions." Kyle pointed out the fact that one image which is very popular and that most people think is a plate of spaghetti is actually five sardonic octopi -- it's called "Octopus Mountain." Another picture, "Octopus Blast," depicts a multi-armed, grimacing octopus catapulted in a saltwater jet stream. Kyle Thomas's images are surprisingly clear and witty, considering their prodigious production in a single month. A positive message can be clearly discerned by the upbeat, satiric and nostalgic ideas in this work. Quotes such as "If you eat garbage, you'll live forever" and "I still believe that life is magical" present the sarcastic and idealistic simultaneously. This is the inspired rebel at this angst-filled silliest. It is also the first soundings of an instinctively authentic and talented picture maker with as many visual gifts as an octopus has tentacles and a particular interest in exploring those appendages of inspiration. The show was entitled "give the monsters a hug," by Kyle Thomas, that's King Tuff. Eric Reagan is part of the creative team "MouseLion" along with his wife, Pam Reagan. They have been active as artisans locally since their arrival nearly a decade ago from Texas. Producing a variety of pastels, wall sculptures, masks and other castings, they use themes from nature and figures from pastoral and magical realms as their subject matter. Their works have adorned the walls of the famous local purveyor of home-ground coffees, Mocha Joe's Cafe, on numerous occasions. Most recently, they had a fantastic selection of masks on exhibit in time for Halloween party-goers. 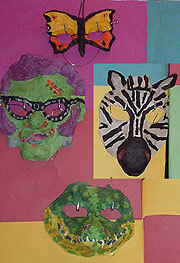 The handmade papier-mâché masks double as costumes or fine works of art. 2003 is actually the third year these masks have been produced. The technique employed in their mask-making has evolved each year. Early on, the wolf and bear had seasonal themes -- the wolf with a garland of ivy and the bear one of blueberries with blueberry stains on his mouth. Next came fantasy characters such as Pan, a wizard and a harlequin, along with a host of woodland creatures. Eric's technique for lightweight casting has reversed itself over time. 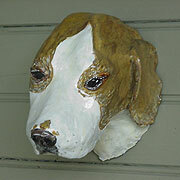 At first, molds were made of papier-mâché and masks of self-hardening clay. Now, plaster, clay and casting plastic are used for the hardened molds, while a refined, one-step papier-mâché technique is used for the mask. The technique developed out of Eric's desire to keep his prices low. The masks are not painted but are layered with paper that already has the final color. They are actually "painted" with paper. This year's cast of Halloween identities included a cornucopia of characters: cat, goblin, butterfly, monkey, Franken-Elvis, snarling jaguar, puppy dog, dragon, crocodile, moose, elephant, frog, raccoon, pig, and zebra. One of the more artistic examples is the black, white and tan zebra. Of course, each handmade examples is unique and each individual zebra has a slightly different pattern of stripes. But hanging on a wall near aboriginal or native items, it seems a part of some tale of travel and adventure. The choice of the mask as a creative medium for Eric Reagan came from his interest in Japanese Kabuki theater masks, Pacific Northwest coastal Indian masks, and Shamanic masks in general. His papier-mâché technique is a throwback to ancient Japanese mask-making. But Eric has also told a story of when he was a boy traveling south in a Pullman car to Mexico City. There he experienced the "Ballet de Folklórico." His memories of the masks used in dances from Mexico's ancient and colonial history and the many masks he saw hanging in the Mexico City market evidently made a strong and mystical impression in the receptive eyes of a young boy deep in a magical land. Eric Reagan is that Mask Man.